Gotta Snap 'em All! No, no, we're not talking about necks. Is there something you think we should be reporting on? Email news@usgamer.net. Pokemon Snap for the Nintendo 64 turns 20 next month, and you can bet the world is filled with old fans who repeatedly tell their apathetic kids about how the photo-snapping Pokemon adventure is the GOAT. A true sequel is probably never coming, Pokemon Snap faithful, but maybe Pokemon Go's upcoming "Snapshot" feature will sate your desire to Snap 'em All. Niantic announced Pokemon Go's picture-perfect mode in a press release distributed earlier today. 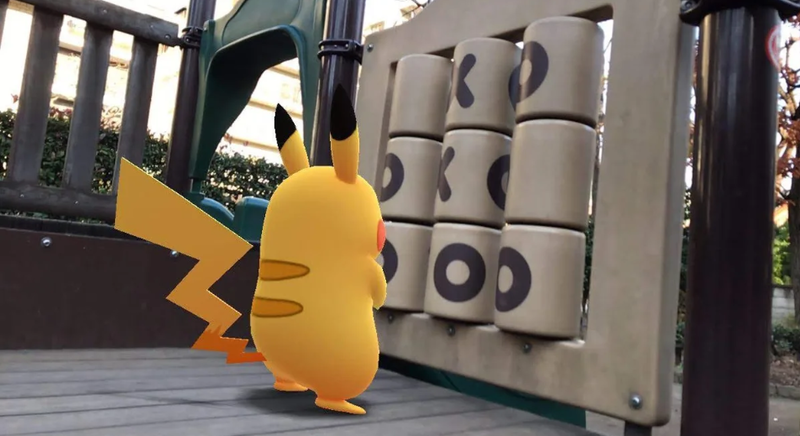 The team's noticed how Pokemon Go players love using the mobile game's augmented reality (AR) feature to chronicle Pokemon's adventures into the real world, so it constructed the Snapshot feature for more robust options that are easier to access. "Select a Pokemon and tap on the screen to throw its Poke Ball to that spot. Once your Pokemon is situated in the ideal spot, you can then move around it to find the best angle for your photo," the Pokemon Go team explains on its official blog post about Snapshot. "Is your Pokemon distracted or looking the wrong way? Brush across it to get its attention, and it will be sure to face you." Once you take all your photos across a session (preferably while crying "Work it, darling! "), they save automatically to your mobile device. Snapshot links to several social media services, so get ready to have something more interesting on your Instagram account than the photos of the deflated lasagna you cooked last night. No, Pokemon Go's Snapshot option isn't the direct Pokemon Snap sequel you've been dreaming about since you were a rugrat running around with your wallet chained to your pants, but it's not a bad little feature, either. It's another cool addition to the app, which enjoyed a killer 2018 thanks to the addition of Sinnoh (Gen 4) Pokemon, Trainer battles, and the gift-swapping Friends system. If you're playing Pokemon GO and want some help, we've got plenty of Pokemon Go Guides. Check out that hub or head straight to our individual guide pages. You'll find tips on Pokémon GO Eevee Evolutions , Pokemon GO Trading, and Pokémon GO Ditto List - How To Catch Ditto. There's also a look at the Pokemon GO Celebi Quest Guide. and the latest info on this month's Pokemon GO Community Day. Finally, Smeargle was just added to Pokemon Go, so check out our Pokemon Go Smeargle Guide. Tagged with Android Devices,	iPads,	iPhones,	News,	Niantic,	Pokemon,	Simulations. Sometimes we include links to online retail stores. If you click on one and make a purchase we may receive a small commission. See our terms & conditions. Get the best of USG in your inbox by subscribing to our newsletters. Here's your guide to the Pokemon Go April Research quests and rewards. Is a late 2019 release in the cards? The new fighter in Super Smash Bros. Ultimate could be a top-tier contender. To dress like you're ready for a zombie apocalypse will apparently cost you. Chrono Trigger's sublime soundtrack arguably tells its classic story more effectively than its character dialogue. Gotta get back in time. Dreams has scope unlike any other creation-focused game before it. Up, up, and away with Nintendo's attempt at virtual reality. Mode 7 graphics and steak knives no longer occupy the same branch on their family tree. The Top 25 RPGs of All Time #1: Chrono Trigger Chrono Trigger's sublime soundtrack arguably tells its classic story more effectively than its character dialogue. Apex Legends Almost Feels New Again After Its Latest Patch I can engage in long-range combat now? What? Katana Zero Review It's a bad trip, but a great game.